Online math tutoring works best with a laptop or desktop coupled with a Wacom Tablet, available from Amazon or Best Buy (newer version). This tablet works really well despite its small size and low price (about $80). Using this tablet with the stylus, your online math tutoring experience will be similar to writing with a pen or pencil on paper. If you use a large(r) monitor, you will see crisp and clear math solutions. That is wonderful. Oh, and you get to keep all your work in the cloud, accessible via phone, tablet, desktop, laptop. Gosh, how convenient that you can access your work anywhere, anytime. Other graphic design tablets may work well for you. 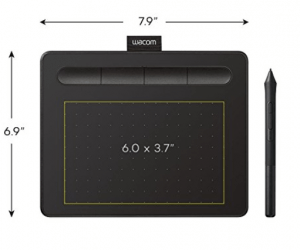 However, the only direct experience I have is with a range of Wacom Tablets, so I feel I can only comment on those. To use the online interactive whiteboard well, you will want a computer with a robust processor. This will be a gaming laptop or desktop for most of you. The processors need to be fast enough so that there is no delay in your writing. If there is a delay, your writing will appear scribbled or, worse, your computer could freeze. So, be safe and use the most powerful computing device at your disposal. If you don’t have a laptop or desktop at your disposal, your next best choice will be a tablet of any sort combined with a stylus. Of the current options, an iPad Pro with Apple Pencil is the best for writing on an online interactive whiteboard. The next choice would be any of the Microsoft Surface offerings, so long as you use a stylus. After that, any variation of a touchscreen should work fine so long as there is ample RAM and fast processors. With any tablet, a stylus is a must. It will be the difference between fingerpainting math versus writing math. 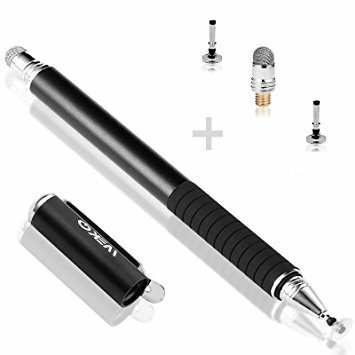 Even an inexpensive stylus from Staples or Wal-Mart will be responsive enough to help you if you are using a touchscreen. Here is one I’ve used in 2017/2018. It is only $15 for a 2-pack and comes with many replacement nibs. Please experiment with different writing positions. Some students prefer to keep their tablets flat for writing, while others like to prop them up with a book easel. Find out what works best for you. For your books, I recommend the book easel shown above. 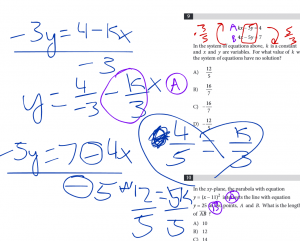 If you are working with online material, you can use a separate device to display the math questions. That way, your writing device can be fully dedicated to working on the math questions. This is a small but important detail. Hope this helps. If you have any questions regarding online math tutoring devices or any other aspect of online math tutoring, please contact Martin at mcstutoring.com.